The Tyrolean town of Bruneck in the South Tyrol, Italy sits in a valley and is backdropped by the majestic snowcapped Alps. When the Tyrolean town of Bruneck in the South Tyrol, Italy was established in the 13th century by the Bishop Bruno von Kirchberg, it was just a little narrow street with a few houses on either side. Bruneck - the Italians know it as Brunico - was first chronicled in 1256 (February 23rd).As Bruneck, in the Trentino-Alto Adige region of the South Tyrol, was developed, discoveries of Stone Age relics were uncovered, which means there were inhabitants in the area in the Iron and Bronze Ages. Onward from the Roman era the entire Val Pusteria region, of which Bruneck is the largest town, has been populated by many settlers. South Tyrol, Italy in Europe. ... 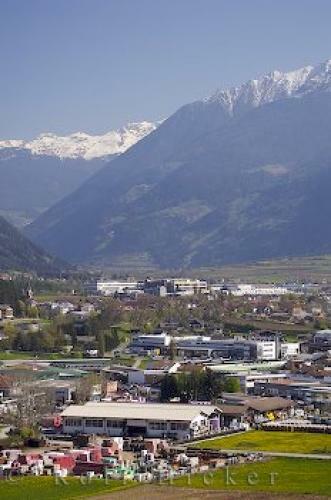 Both the town of Bruneck and the surrounding little villages of the South Tyrol have excellent facilities for all manner of sports. One does not have to be athletic to enjoy the Tyrolean town of Bruneck/Brunico in Italy, the Stadtgasse, in the town centre, is a wonderful shopping street with all the latest fashions and a variety of interesting shops, especially those selling the local handicrafts. The architecture and history will also please visitors to Bruneck. There are the Rainkirche and the Ursulinenkirche - lovely old churches built in the Middle Ages, the 13th century Bruneck castle, and many charming buildings in the old part of Bruneck. When travelling through the South Tyrol region of Northern Italy, the town of Bruneck/Brunico should be a stop along the way. View over Brunico (Bruneck) backdropped by snowcapped Alps, Italy, South Tirol, Europe, Europe 2006. I photographed this photo with the digital SLR camera model Canon EOS-1Ds Mark II, aperture of f/6.3, exposure time of 1/160 sec. on ISO 100, as always I used a original Canon Lens, the focus lenght for this picture was 115mm.